The unit is assembled. I can put aside the scalpel, green stuff and clay shapers for another while and take out the brushes again. 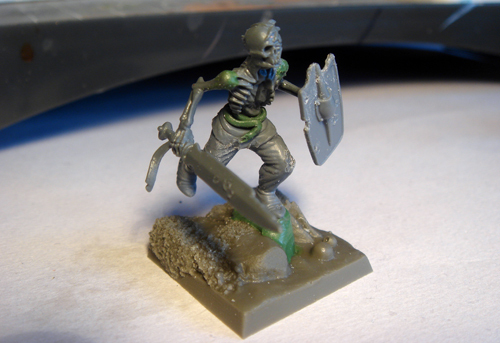 Putting these models together has been very enjoyable, indulging my undead Celtic bog mummy habit. I'd had that unit in my head a long while, it's nice to have it translated into reality and stood before me on the painting table. With three models already painted, I've a good idea how the rest of the unit will go. First off though is the slaver filler, I really want to see some paint on this guy. Even before that though, I'm going to get the move tray out of the way. A dull job, but at least with that done I'll have somewhere to put the models as they are painted! 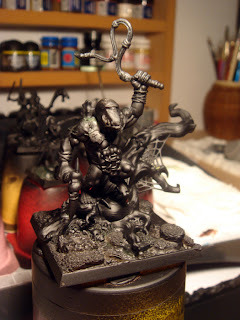 After the half-dead are painted I have another character primed and ready for the brush, a low level wizard this time. Already though, I'm thinking of the next unit I want to build. There's the marlwyrm riders (skullcrushers), the warped ones (forsaken) or, possibly the hag wyrm unit (dragon ogres), one of which you can see below. I think I'll need to work on drool for this unit. I may add smaller worms to the bases for these too. Some new pictures of the imminent chaos release are surfacing. I know this stuff is all out in White Dwarf tomorrow, but I need to gush a little about the forsaken kit. Look at these guys. 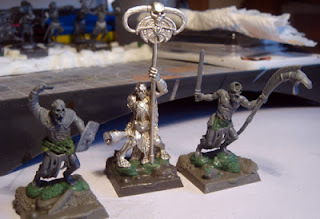 As the person who sent me these images said, 'as if they just popped out of the old realm of chaos books from the late 80's', and I couldn't agree more. That's some old school chaos crazy right there. There's so many usable bits in that kit it makes my brain ache thinking about the possibilities. I can tell this is going to be a popular kit, I'll certainly be having one. As my own army is fimir based on the Warriors list, I can see a unit of warp-spasming fimm warriors appearing real soon using a fair dose of these parts. It's all I can not to start an actual Warriors of Chaos army looking at these mutant nutters. It has to be said, nice one GW. Bang on. 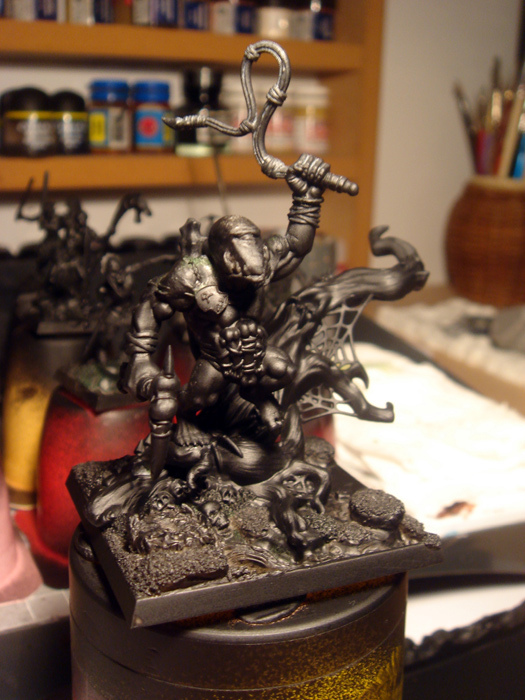 In other news, a better photo of the slaughterbeast, who looks a lot better from this angle I think. Yep, they found his good side. Here's the latest batch of bog mummies. The running fellow is one of my favourite models from the entire unit. 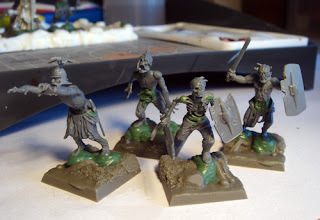 Originally the legs weren't in a running pose, but as I'm keen not to have some non standard zombie poses in the unit (yes, I know the guy on the extreme left is classic zombie posing, but you have to have one, don't you?) I adjusted the feet a bit so he looks like he's jogging along at a fair clip. I'm also pretty happy with the torso/head on this lad. Originally a grisly trophy held aloft by a ghoul, I think it makes a great basis for a bog mummy with the chest all disintegrated. Lovely. 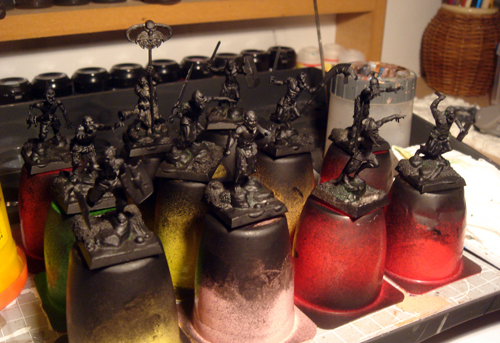 So, the next update will be the completely assembled unit, then, fair readers, it's painty time. Khorne is now hatred not frenzy. Forsaken are core with M6 . New monsters are rare, expensvie (200+ points) and fill an already overcrowded slot. WoC sorcerors now seem to have access to Shadow, Metal, and Death. Supposedly, you have to mark up a sorceror (so undivided would be gone), and they then get access to one of the book lores, or spells from that mark. 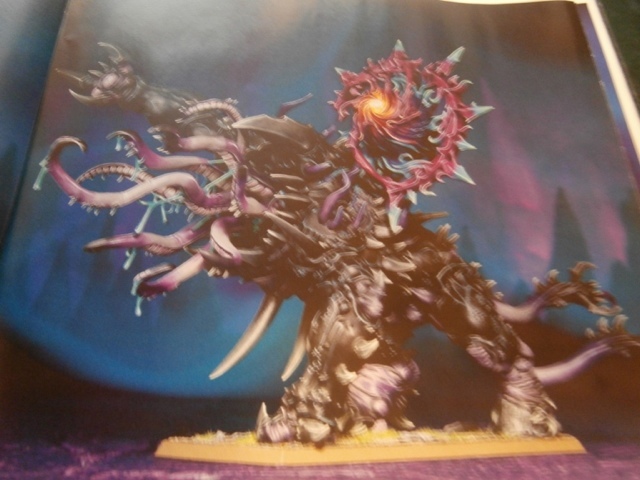 It works out as Nurgle/Death, Slaanesh/Shadow/ Tzeentch/Metal. Slaugherbeast is rare, can apparently use the Chaos Lord's WS under certain circumstances. (It's bound to his will, might be similar to the old crown of command - It's NOT a mount) Gorebeast Chariot is special. Mutalith is rare, Skullcrushers stay rare. Ensorcelled Weapons might be an upgrade instead of standard. 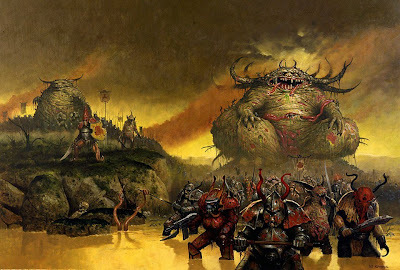 Nurgle: Lore Attribute is (I assume after successfully casting a spell) that on a roll of 6 on a D6 the caster's Wounds and Toughness is increased by 1 until the end of the game. The signature spell can be cast on Nurgle's holy number and is a flame template which causes a wound after a failed toughness test. No mention of it being treated as breath weapon, so it might not be usable in close combat. Tzeentch: For every 6 you rolled when casting a spell, you generate a power dice for the caster on a roll of 6 on a D6. So Irresistable Force at least grants you two power dice before you go boom. Slaanesh: Your Attacks, Initiative and Weapon Skill are increased by one until the end of the next magic phase. I'm coming a little late to the party here I know. 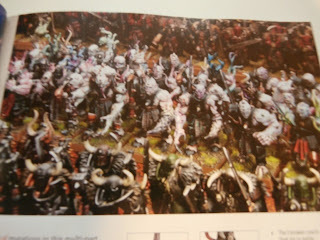 The images for the new Warriors of Chaos book and models started appearing yesterday and since then have been all over the net. No doubt you've all seen the images of the various new kits. If not, you can see them here. There's an avalanche of new kits as well as the new army book, all the more surprising as the general wisdom was expecting a new dual warhammer/40k daemon release in February, and here comes the Warriors of Chaos all up in our face with new kits by the bucket load. 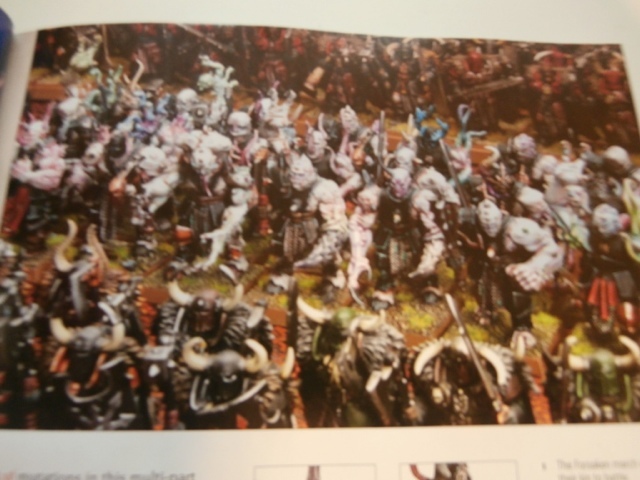 Most interesting to me of the existing units getting new models are the new dragon ogres and forsaken, both of which one never sees on the table. Are we looking at new rules? I sure hope so, because right now dragon ogres are shining the shoes of the skullcrushers. As for forsaken, never was a unit better named. Let's hope they get the love, as the forsaken kit looks pretty interesting. But, there's new units too. New stuff that makes me reach inadvertently for my wallet. The giant tentacle monster is such a stuff. I'm not sure what it's name is yet, but hell, look at it. LOOK AT IT. It's a slice of awesome sandwiched between the bread of amazeballs. One please. The other releases are rather fine too. The beast chariot, the Throgg model, vilitch, the chaos lord, all a bit great. I can't wait to get my hands on the book to see what the changes are there. No more infernal puppet for me, I'll bet. On a more personal note, this means big things for my fimir army, seeing as it's based on the Warriors of Chaos list. I already have an idea for a unit of warp-spasming fimm to use as forsaken should they end up worth taking. 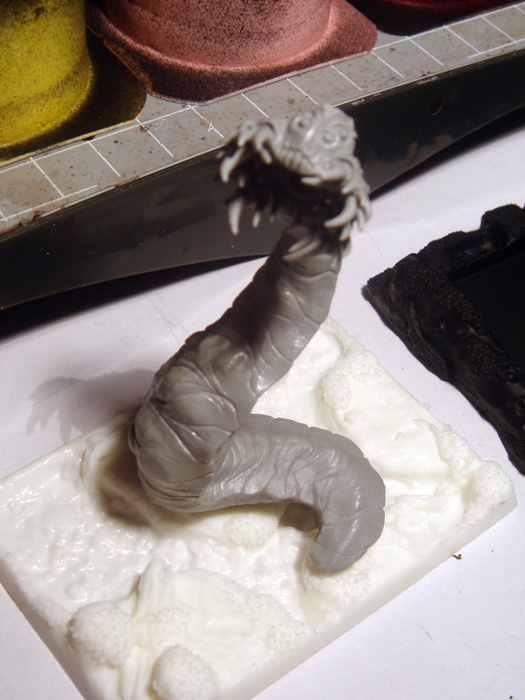 The tentacle monster fits right into my wormy, tentacle laden theme for the fimir army as it is. Just take off the chaos icons and add some fimir handlers/riders/crew and we're there. Well, I might convert it a bit more, we'll see. It might be garbage in game though. But... it's too beautiful to be garbage. Exciting stuff, I guess all list building will have to pause until the army book is released, probably early February, one would imagine. The cutting, burning and sculpting continues on the half dead, with another three members ready for priming. The standard bearer is an old Celtos model. 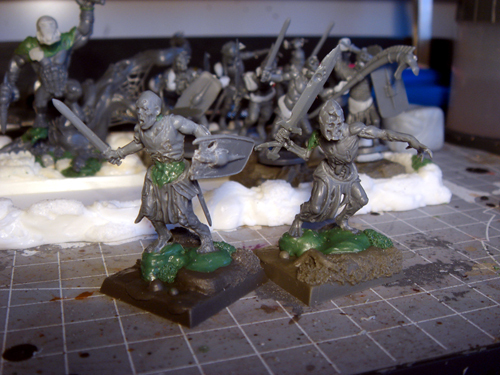 I had to lengthen the torsos of the plastic Celtic warrior parts I'm using as they need to be a little longer to maintain proportion with the legs. This is easy enough for the most part as the open stomachs are simple to sculpt. The fellow wearing the chainmail was another matter, and once this was done I felt he needed something more, so the loose belt was added. I love the Celtic horn the musician carries, it's such a crazy huge instrument. 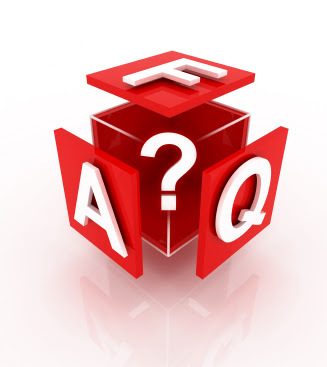 Some new Warhammer FAQ's up today, see them here. The new changes are for the rulebook, Daemons, Skaven, Empire and Dwarves. On first glance they are mostly clean-up, the main rules clearing up some magic questions. The Skaven FAQ does state a rider on a bell or furnace now tests separately if hit by dwellers etc, and in the Empire FAQ the war altar does not pass on stubborn or the ward to the rider. There's been a bit of a dearth of fantasy releases from Games Workshop of late with all the 40k, so when some new Forgeworld goblins showed up I was as happy as a starving man given a spam sandwich - far from ideal, but hell, it's a sandwich. All spam-related comparisons aside, (for now) these gobbos look very nice indeed. The armoured squig and the shaman are superb, and if I played orcs and goblins I'd be super happy. Plus, this means that the Blackfire Pass book is getting closer to release. Also, from Mantic comes the goblin war trombone. I don't know what the hell this thing is, or does, but damn, what a great idea. I may pick one up and figure out what the hell to do with it later on down the line. Every goblin army should have a war trombone. A small update. I've a couple more half dead converted, and I finished working on the slave driver's base. I'm very happy with the slave driver, he's going to be a lot of fun to paint, and I can't wait to paint up his base. 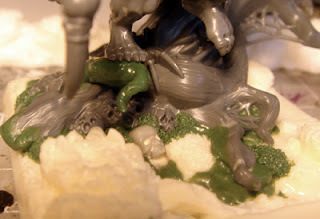 He'll also need some water effects to go in the recesses. This model will need to look really good, as it will most likely be the unit's focal point. The two half dead here are just rank and file, grist for the mill as it were. I used the solder pen again, on the shield and abdomen on the one on the left mostly. Half the unit is assembled now, so we're getting there. Next up is the musician, who I'm looking forward to assembling up as he carries a long Celtic horn which will make him stand out a fair bit. 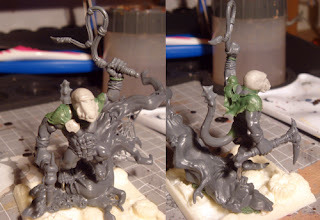 I'm currently working on the fimir slave driver for the half dead unit. I love working on fillers, they are a great opportunity for building the theme up of the unit. For the half dead, when the unit is finished it will be immediately apparent that the fimir have little regard for, or fear of these undead, literally whipping them into battle. This fellow has a couple of new components I haven't used on fimm before. The resin fimir heads worked out great, and this is the first time I've used one in a conversion. Also, the broch holding his tattered cloak on is from Scibor. There's a nice range of Celtic style shields and armour bits I picked up from there, which will work perfectly on the fimir warriors are heroes. The massive shields I'll save for the marlwyrm riders. Now the slaver is curing, I'll move onto the base, which needs to have the tree stump properly integrated into the base, as well as adding some more details. So, we stare into the blasted wasteland that is January. Traditionally my least favourite time of year, I refer to the months of January and February as 'the waiting room', as they are the most dreary of months. However, they are great for getting some hobby time in, so this year I will endeavour to make the most of these two grey months and get some stuff made and painted! Over the holidays I came into possession of two of the first three Citadel Compendiums, and the second (first version) Citadel journal. 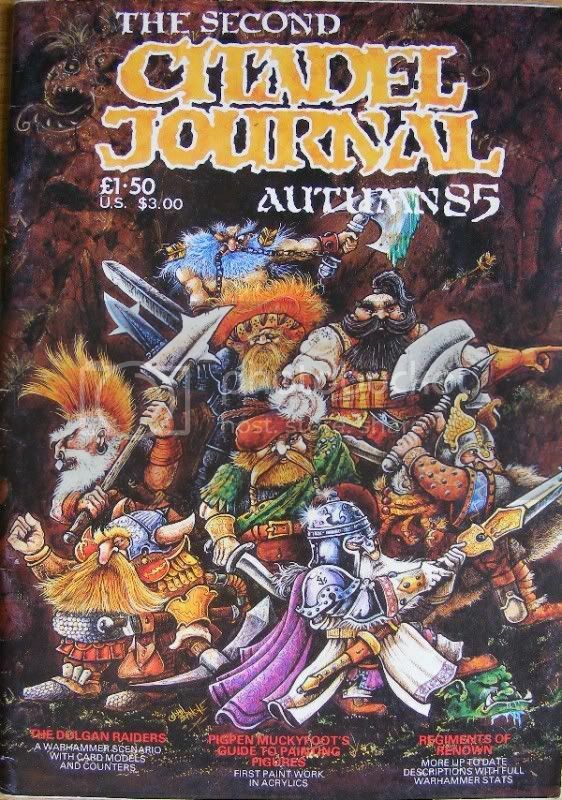 Treasure troves of old school warhammer yumminess, they kept me entertained over the holidays with old warhammer scenarios, pages of Citadel miniatures from the golden age of the 80's, the first Kaleb Daark comic strip, even some shield and banner designs and some cardstock terrain! Ah, happy times. Now I just need to track down the rest of these old slices of Citadel nostalgia. I believe there were four journals and three compendiums all in all. On a more 21st century note, I received the new chaos warshrine as a Christmas present. A great kit, though I wouldn't really be interested in assembling it as intended. No, this beauty is going to end up as a fimir war altar. I have a lot of hacking and sculpting planned for this model. I think turning the mutant bearers into fimir warped ones will be my favourite part of the project, though making a human-scale dirach to stand at the front of the altar will be good fun too. I may magnetise him so I can use him on a 25x25 base as an extra wizard if needs be too. I have yet to do any magnetising apart from bases and movement trays, but I can see the advantages for variety and ease of transport, especially on the newer Games Workshop kits, which are awkward sizes with lots of slender pointy bits. 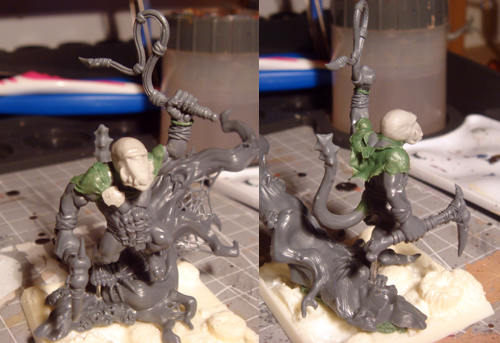 Right at the moment, I am sculpting detail onto the half dead unit's slave driver filler. He's coming on nicely, and I think will look the business once he's done. There was some jiggery needed to get him in the pose I wanted, as all the GW savage orc arm positions are locked, but that wasn't going to put me off, no sir. I'll post up some photos once he's complete.